As you enter the home, you will be welcomed by the large and open floor plan throughout. The villa has a fully equipped kitchen to prepare any meal for the family with a breakfast bar and kitchen nook to seat 4. There is also a formal dining table adjacent to the living area to seat up to 6 guests. Relax in the living area after long days in the theme parks with ample sofa seating. 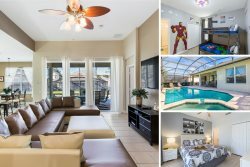 Head to the pool area through the sliding doors and soak up the Florida sun throughout your vacation. The screened-in private pool allows you to take a splash or just relax in the sun loungers at any time. This villa can comfortably accommodate up to 8 guests. The master suite features a king size bed and access to the pool area. There are two bedrooms with queen size bed. The little ones will love their own fun Nemo bedroom with two twin beds. All bedrooms will have their own en-suite bathroom and TV.